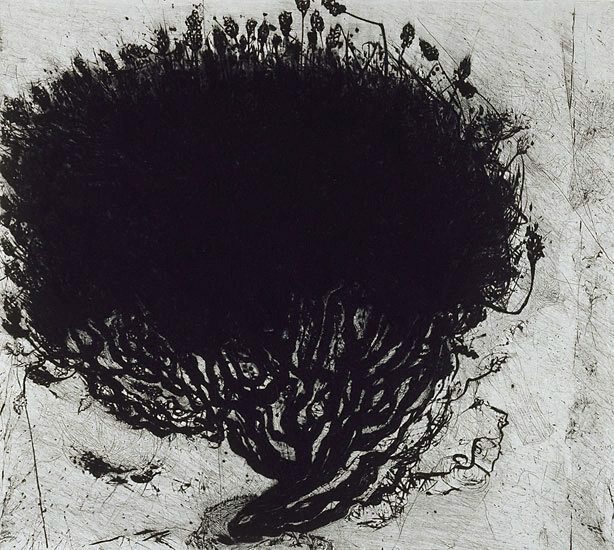 Hertha Kluge-Pott was born in Berlin, Germany and arrived in Australia in 1958 after studying at the Hochschule für Bildende Künste and Braunschweig (Berlin Academy of Art) 1953-58. She studied printmaking at RMIT, Melbourne 1960-63. Her work was included in the Gallery's important early touring exhibition 'Australian print survey' in 1963. She has taught printmaking in Melbourne since 1967, principally at RMIT. In 1981 her work began to be influenced by the landscape and flora of the coast near Cape Bridgewater, in south west Victoria, a theme that has continued to underline her current work. 'Landmark' was etched onto a copper plate that had been used previously by the artist, and printed at her studio in Melbourne. Signed and dated l.r., pencil "Hertha Kluge-Pott 1994". Unknown, Hertha Kluge-Pott: printmaker , cat. 235, Melbourne, 2015, 348.